These Horse & Rider Combinations are qualified at these heights for the $1500 Invitational Hunter Derby. This class will be held on Monday, September 3rd at the end of the day in Ring 3. 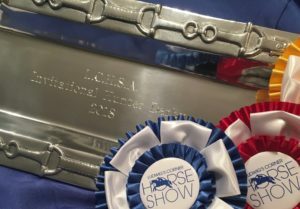 Open to Juniors, Amateur Adults & Professionals who have placed 1st or 2nd in a participating Derby or Classic during the year, including the 1st & 2nd place ribbon winners at our 2018 LCHSA Hunter & Pony Derbies. If less than 12 are entered, it becomes a sweepstakes. The first round is a classic hunter round. The top 12 riders are invited back for a second handy hunter round. The Top Ten ribbon winners also qualify for the CCHSA $3000 Invitational Hunter Classic held on November 18th at Wyndsor Farm. A certificate will be given at the show. Entries received after these dates will incur a $25 Post-Entry Fee. The $25 Office Fee applies to all entries and is non-refundable. This list is current as of August 23rd.